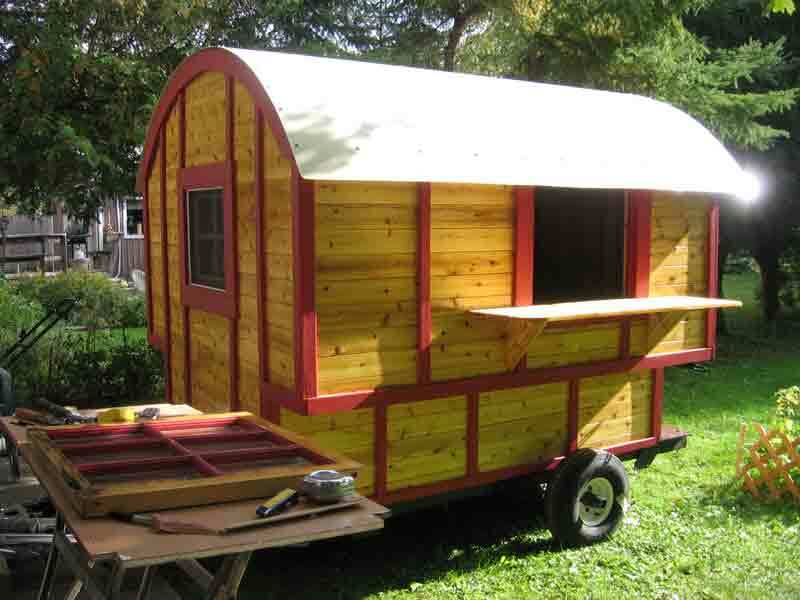 Full size caravans start at $4,300 for the smallest (6' long) and simplest. Most caravans between 8' and 10' long will cost $5,000 - $6,500. Longer caravans may cost up to $7,500. Small specialty caravans are individually priced. The first option is that I build your caravan completely by myself. We'll have lots of discussions along the way, and I'll send pictures at crucial times so you can make decisions. Next, if you live nearby, you can plan work days here in Markdale. We can decide whether I will only work on your caravan when you are here, or I will carry on building between your visits. Alternatively, we can build at your location. In 2007, instead of building at home, I travelled to California. In just under 2 weeks, we built the two caravans you can see on my History page. They weren't complete, but far enough along that they could be finished without me. 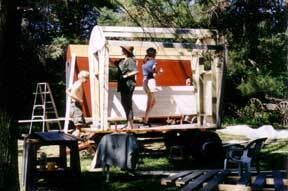 I traveled again in 2010 to build two more caravans - it's a great way to have guidance yet full participation. I will guide you through the purchase and preparing of the base of the caravan before I come, and help you order your materials locally. This way, as soon as I arrive, we can get to work. We can get a surprising amount finished in a short time! In a 10-day time slot, we probably won't have all the details completed, but you'll have walls, roof, windows, door, and the major inside construction finished. This is definitely a community project. 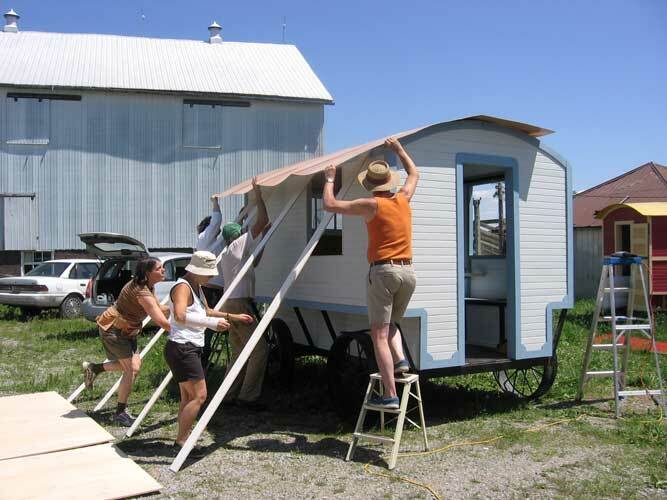 You may have as many friends and family helping to build as you want, and even have 2 or 3 caravans on the go at once! The more people helping, the more work that gets done. Cost: You order and pay for all materials locally, and supply all the tools. My fee is $300/day, travel expenses (either gas or airfare), and room and board while I am with you. Next, you build with my guidance. If you want the security of a project leader, I will guide you from start to finish with detailed advice, sketches, and all the help my many years of experience can provide. By email or telephone, I'll talk you through all the major decision points, help solve problems as they arise, and suggest sources for everything from the base to the roof. My fee for this option is $750. Finally, advice and encouragement. I love to talk caravans... so I provide lots of advice and encouragement to anyone dreaming of a hideaway! Just email and start a conversation. If you live near me in Ontario, drop over to see what I am currently working on.